Flooding and landslides killed at least 91 people and left another 110 missing in Sri Lanka as the monsoon set in Friday, dumping record rainfalls in many parts of the island, authorities said. About 20,000 people were also driven out of their homes in the south and western parts of the country, the Disaster Management Centre (DMC) said. "There are some areas where we are unable to reach, but relief operations are underway," deputy minister for disaster management Dunesh Gankanda told reporters in Colombo. The DMC said the toll rose to 91 dead and another 110 missing as reports came in from areas which had been inaccessible earlier in the day. 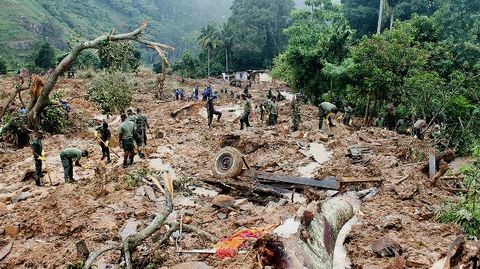 The highest number of fatalities were from Ratnapura, the country's gem hub, where the Kalu river burst its banks and inundated the main town which is about 100 kilometres east of Colombo. Nearly 500 homes were either damaged or destroyed due to flooding as well as landslides, DMC director of operations, Rear Admiral AAP Liyanage told AFP. Most of the deaths were due to mountain sides collapsing on homes, he said. The met department said the worst of the rains may be over, but there could be downstream flooding in the next few days and the authorities issued evacuation orders for thousands of people. The government arranged temporary shelters in schools and other public buildings for people in low-lying areas to move in, the DMC said. The military has deployed thousands of troops to reach marooned villagers and the airforce carried out several rescue operations to pluck people from rooftops of flooded homes. Sri Lanka appealed to the international community, including the United Nations and neighbouring countries, for help as the numbers of dead and missing climbed. "The (foreign) ministry will continue to monitor the flood situation and seek assistance as required in consultation with the Ministry of Disaster Management," the government said in a statement. The latest flooding was the worst since May 2003 when 250 people were killed and 10,000 homes destroyed after a similarly powerful Southwest monsoon, officials said. In the early hours of the day a mountainside collapsed on a women's hostel at a tea plantation at Neluwa in the island's south, killing at least seven women, police said. DMC officials said the monsoon had been expected on Thursday night and ended a prolonged drought that had threatened agriculture as well as hydro power generation. The rains filled the reservoirs used for hydro power, which had hit rock bottom, raising concerns of power shortage in June. But officials said most reservoirs were now so full they were in danger of spilling over and causing dangers of flooding to people living downstream.